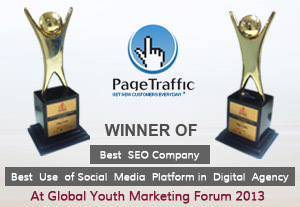 Summary : In February, 2013, PageTraffic received the awards for Best SEO Company and Best use of Social Media by Global Youth Marketing Forum. The award was received by company's CEO Navneet Kaushal at an event in Mumbai. Founded in 2002, PageTraffic has been one of the leading digital search marketing agencies in India. PageTraffic has won numerous national and global awards during the last decade, the latest being The Best SEO Company and Best use of Social Media awards by Global Youth Marketing Forum. The award function was held at Taj Lands End, Mumbai on 14th February, 2013 and was received by CEO Navneet Kaushal. The Global Youth Marketing Forum is the largest platform for digital marketing professionals, youth brand specialists and social media experts. In its third year, the awards have become the most definitive recognition of work being done in the digital marketing arena. Navneet Kaushal added "We won the Brand Academy Award for Best Search Marketing Agency earlier this year. There is a lot of action and recognition in the industry now. I am glad at the pace at which the digital sphere is growing and we are looking forward to exciting times. "2013 has been great and it has just begun. I am very excited about winning not just one but two awards at this incredible event. We have been working hard and it feels nice to see it all pay off. We started offering social media marketing services a couple of years back to our clients, so the award is in that category is so much sweeter," said Navneet Kaushal. Starting as a SEO company, PageTraffic has evolved over the years to become a one stop digital marketing company. Today, they offer website design and development, social media marketing, ad campaign management and reputation management too. PageTraffic also helps enterprise level clients in managing their overall campaigns, training their in-house teams and provides strategic inputs too. PageTraffic has been striving to spread awareness about the industry in India. Mr. Navneet Kaushal has been speaking and conducting workshop at the most represented of the industry conferences in 2012, such as Click Asia Summit, Search Engine Strategies, TFM&A & SEMPO. He has also been invited to numerous campuses around the country including IITs, Galgotia Business School, NIMS etc. The agency is known for its SEO services, web design services and its unique SEO/SEM Training & Consultation services. PageTraffic is one of the most respected search marketing agencies in India today. Having started in 2002, PageTraffic has already worked for more than 5000 clients across 36 countries. PageTraffic helps businesses achieve top ten rankings, get qualified traffic and generate exponential sales.